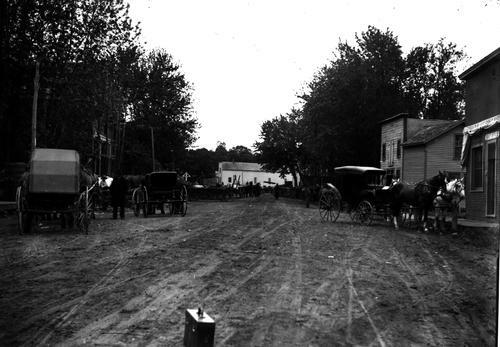 Lake Elmo Main Street in 1906. Lake Elmo became a popular summer resort. There were many livery stables in St. Paul and Stillwater and a large part of their business was taking people out to Lake Elmo. In 1872 the St. Paul, Stillwater & Taylor’s Falls Railroad (later the Omaha Road) passed through Lake Elmo, making it easy for tourists from St. Paul to reach the lake. A. B. Stickney was presumably acting for the railroad when he purchased the land between the railroad tracks and the lake. There he built an “elegant and spacious” 58-room lake hotel. Probably Stickney’s influence caused the county fair grounds to be built on land he owned at Lake Elmo in 1875. In 1876 at the fair, baseball was the game and there were matches every day. Unfortunately in 1877, a tornado hit the fairgrounds and the fair was moved to Stillwater. In the early days, the Lake Elmo commercial center, which grew up around the railroad station, boasted a store, saloon, a “flat” grain house where farmers could unload wagons directly onto the trains, a blacksmith, and a wagon repair shop. In 1888 the Iowa Land Company bought Stickney’s property and the adjoining Lohmann farm, platted the area and laid it out into lots. By the 1920s the Stillwater Road had been paved and the village was established as a substantial shipping point and dairy center that boasted a creamery, grain elevator, two grocery stores, hardware and implement stores, a private hospital, a bank, a garage, and even a roller skating rink. The downtown area was platted as Lake Elmo Village in 1925, the year a second creamery, the Twin City Milk Company plant, was built. Lake Elmo gradually lost its importance as an agricultural center, but began to see residential growth as suburban development moved eastward from St. Paul. One of the most ambitious projects of the 1960s was Cimarron, a planned community of manufactured homes next to a golf course south of the village. The construction of Lake Elmo Airport (actually in Baytown) in 1952 kept the city on the map. Today much of the city is taken up by Lake Elmo Regional Park Reserve, on the western shore of Lake Elmo. In general, Lake Elmo has elected to remain rural, limiting the typical suburban development overtaking much of the rest of the county. Its population growth, from 5,900 to 7,900 in 2005, has been contained. However, Lake Elmo is planning for strong growth over the next two decades, including development of the Historic Old Village area.